Ah, holiday party season. The season of tree-trimming and tinsel, secret Santas and yankee swaps, mulled wine and spiked cider (though hold the egg nog for me, please). It’s a time when we put our obligations on hold for a bit and take time to enjoy the company of our closest friends, family, and coworkers (nice to meet you, Mavis from accounting!). But why do some holiday parties seem to shimmer with positive energy, while others fall flat? It turns out that the physical environment can play a big role in how people interact with each other at a party, either cultivating a sense of convivial intimacy, or making people feel awkward and uncomfortable. Here are a few surprising tricks I learned while researching Joyful that can help you throw your best holiday gathering yet. In northern climates, holiday decorations arrive at just the moment when the landscape outside becomes brown and bare. Lights, garlands, and other colorful decor helps set the mood, and it turns out that this is supported by research. A study of holiday decorations in a neighborhood shows that a decorated home sends subtle social cues that make the residents of these homes seem more approachable and friendly. Decorating the house early can also help build anticipation for your festivities, which research shows can be almost as enjoyable as the event itself. So feel free to start decorating as early as you want. No judgment! The other day I found myself in midtown Manhattan. I felt a bit like a salmon swimming upstream, but despite the crowds, I had to sneak a quick look at theRockefeller Center tree. As I rounded the corner and saw it, my breath caught in my throat and I heard myself gasp. I’ve seen this tree dozens of times in my life, but it doesn’t matter. Even though I don’t love the idea of cutting down such a vast, beautiful tree for a brief spectacle, emotionally, I find it so moving. Now many people will tell you to get a tree that fits nicely into your space, but the lure of the big tree (or big wreath, menorah, or centerpiece) is just too compelling. Well, I’m here to tell you: Don’t fight that impulse! Celebrations need centers, and an oversized element creates a kind of anchor for the festivities. In the same way that larger bodies in space have a greater gravitational pull, large items have a magnetic quality, drawing people together. Whether it’s a big tree, a bonfire, or a punch bowl — big things signal that we are no longer in an ordinary context, but in a celebratory one. They transform the space around them. It’s important to note that this is proportional. You don’t need the Rockefeller Center tree in your studio apartment. But finding something that feels big in your space, whether that’s a big bow over your mantle, a large roast set on a decorative platter, or maybe a magnum of champagne instead of a few smaller bottles — these things have a subtle yet powerful effect, giving your guests something to gather around. And if you have limited budget or energy for decorating, resist the temptation to put a little bit of something everywhere. It will hold the party together more if you concentrate your decorations in a couple of spots (a large cluster of candles on your coffee table, say), rather than scattering them in little bits all over the house. 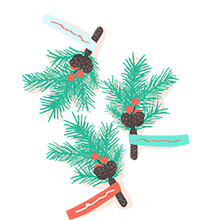 PS: If you don’t love the idea of cutting down a tree each year, consider getting one you can plant in your garden to turn the holiday magic into a source of year-round joy. A growing body of research shows that nature helps relieve stress and improve mood, and may even affect our behavior toward other people. In one study, people in a windowless room were more generous to others when plants were added to the room. Other studies have shown a decrease in irritable or aggressive behavior in buildings where there was more greenery around the outside. And few times of year have as much potential for stress than when families get together for the holidays. So give the evergreen trees in your yard a prune and bring the branches inside for a little natural decor. (Or check with your local florist or farmer’s market, as many have these on offer.) Take a nature walk and have the kids gather pinecones for a centerpiece. An added bonus is that researchers in Japan have found that some trees, including certain species of evergreens, secrete chemicals known as phytoncides, which stimulate the activity of a kind of immune cell in our bodies. These natural killer (NK) cells help fight off viral infections. So with cold and flu season underway, natural decorations might also help give our immune systems a helpful edge. PS: For a fun and affordable nature-based decor idea, check out this DIY for botanical ice lanterns. “Glitter celebrates,” the late actor and writer Carrie Fisher once said in an interview. “It’s happy. It makes you look like you’re up for a good time.” She used to keep glitter in her purse and sometimes toss a pinch of it into the air at her book signings. Sparkle, whether in the form of glitter or tinsel, a disco ball or other metallic decor, creates an undeniably celebratory atmosphere. One reason is that sparkle replicates the quality of light of fire — a flickering, dynamic light that scintillates in the darkness. Though now we take for granted that abundant light is available at the flick of a switch, light at night used to be mostly a celebratory thing. In medieval times, on holy days in Europe, or the emperor’s birthday in China, cities would be ablaze with lanterns. But otherwise, such light at night was a rarity. String lights offer a modern version of this joy, seeming to twinkle in a darkened room. Candles, especially in cut glass or metallic holders, also add sparkle. Shimmering ornaments also add sparkle, and you can easily add glittery attire, accessories, or makeup to your holiday ensemble. 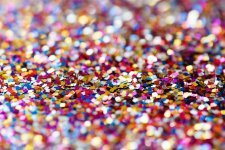 (And if you can, use a biodegradable glitter like this one to avoid contributing to the micro-plastics problem!) To me, it’s not the holidays without my glitter shoes, which make even a trip to the grocery store feel like a party! Even sparkling drinks add to the festivities, whether that’s champagne or a fizzy mocktail. PS: If you’re doing things last-minute, check out Ina Garten’s trick for fast-chilling champagne here. Sure a theme party can feel like a little bit of effort, but research suggests the work is worth it. Studies show that wearing something similar, say costumes or team colors, creates a visual harmony that breaks down barriers among people. People say they feel more connected and more trusting of others. They become more comfortable with less personal space, literally creating a kind of physical intimacy among the party. It doesn’t have to be huge. Sure, an ugly Christmas sweater party is one way to go, but you could also have silly hats or glasses on offer (common at New Year’s Eve festivities). Or you could offer fun enamel pins or buttons as a party favor that people might pin onto their clothes. Even just asking people to wear a particular festive color can help create this sense of visual harmony among the group. Music plays a big role in bringing a group together, and studies show that when we move or sing in a rhythm with other people, it can lead to a phenomenon collective effervescence. Coined by the French sociologist Emile Durkheim, collective effervescence is a kind of euphoric feeling of oneness and belonging. Sure, you could orchestrate a sing-along or go caroling, but if you want a more subtle approach, play songs that everyone knows. The familiarity will make singing the choruses irresistible and increase the likelihood people will want to dance too. If you want your dinner party guests to really gel, then make sure the meal you serve is family style. A new study from the University of Chicago shows that when people eat from shared plates, they become more likely to cooperate with each other. The effect even holds among strangers, so this becomes even more important when you have distant cousins or new in-laws or mystery guests around the table. Even if you’re only serving hors d’oeuvres, look for foods with a shared element, like fondue or even a cheese plate, over dainty standalone canapés. 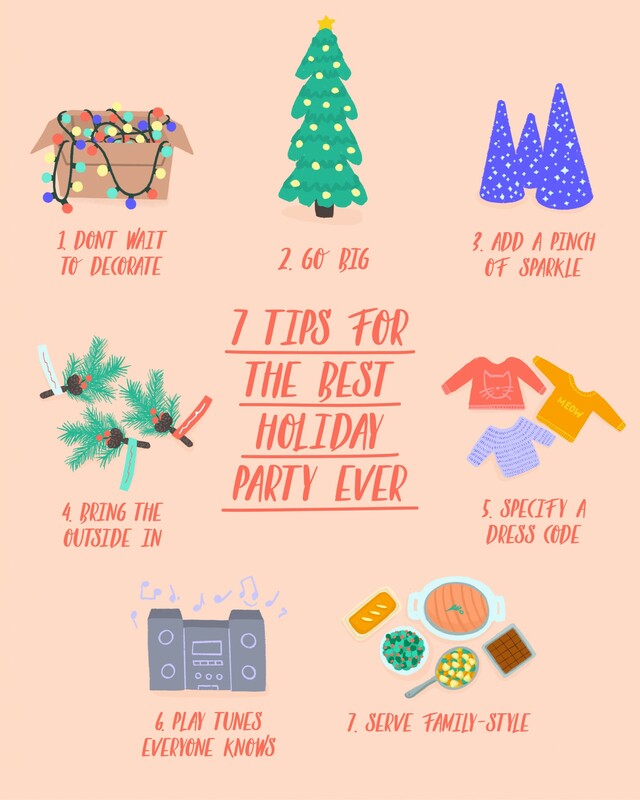 Do you have any favorite tips for making a holiday party a hit? Share them in the comments or with me @aestheticsofjoy on Instagram. I’d love to investigate and see if there’s science behind them!